The recent fundraising project conducted by the Australian Friends of Shaare Zedek Inc is having tangible benefits for both the community in Australia and Israel. During last year’s campaign, funds raised by the Australian community purchased a gene sequencer at Shaare Zedek Medical Centre Jerusalem in memory of the late Ron Tatarka. Ron was a true visionary who supported many important communal causes. His family members have continued their involvement with Shaare Zedek. Their generosity and that of their family and friends have been a real tribute to his memory and are continuing to have a powerful effect on the healthy future of our community both here and in Israel. 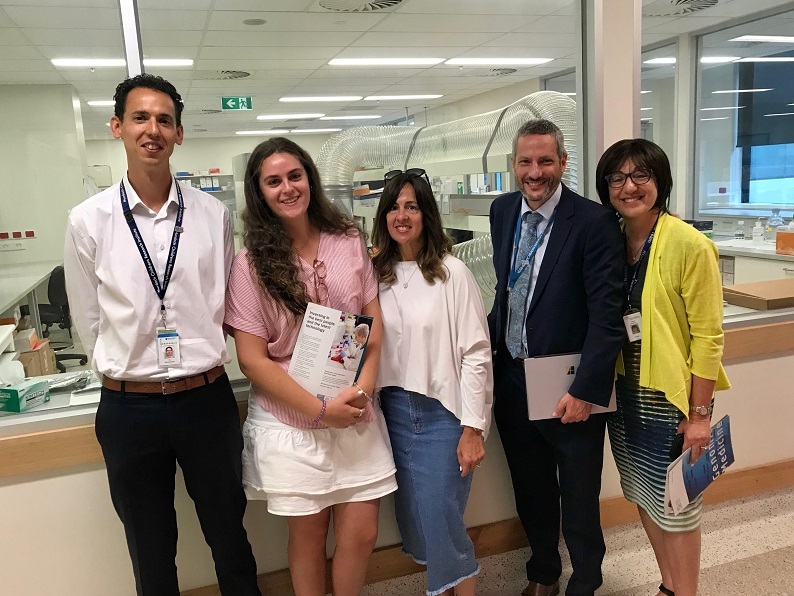 Sarah Tatarka and her daughter Dina recently toured the Royal Children’s Hospital’s Genetics Laboratory as part of a group hosted by clinical geneticist and Australian Friends of Shaare Zedek Inc Deputy Chair Prof Agnes Bankier OAM. During their tour, they saw the gene sequencer at the RCH and heard about the latest developments in gene therapy. Professor Martin Delatycki described scenarios where a patient can have a disease and be hospitalised in Intensive Care. Diseases that in the past were a mystery can now be identified within days using gene sequencing and targeted therapies can be prescribed. The lifesaving effects of gene sequencing and therapy are transforming the delivery of medical care. Shaare Zedek plays an important role in this medical revolution. As Jerusalem’s most central hospital treating hundreds of thousands of patients year after year, it has a database that has serious ramifications for specific ethnic communities around the world. Genetic studies at the hospital are directly applicable to our local Jewish community. Shaare Zedek’s Medical Genetics Unit is actively involved with studies surrounding the increased risk of certain cancers in people who carry the BRCA 1 and 2 genetic mutations. Based on these studies, the AFSZ is currently working to support JeneScreen.com.au, a research project conducted by Prof Martin Delatycki offering free genetic testing for BRCA mutations to the Jewish community in Melbourne and Sydney. This year, the Australian Friends of Shaare Zedek will build on these important advances. Innovations invariably raise new challenges and Shaare Zedek has always operated within a framework of Jewish medical ethics. Prof Rabbi Avraham Steinberg will visit Australia as a guest of the AFSZ. Prof Rabbi Steinberg is the Director of Medical Ethics at Shaare Zedek. He will deliver the opening address of the 11th Bioethics Conference at the Royal Children’s Hospital later this year. Prof Agnes Bankier OAM says, “We would like to thank the Tatarka family and the wider Australian community for their wonderful support of this outstanding project.